Connected car devices enable internet access to the car and thus, allow transmission of data within and outside the vehicle. A connected car device is employed to improve user experience, safety, and fuel efficiency. Advancements in IoT, wireless communication, and smartphone technology are driving the consumer demand for internet connectivity, which in turn is boosting the connected car device market. Increased efforts by government agencies to boost the adoption of V2X technology is expected to drive the connected car device market. The U.S. Department of Transport has mandated vehicles to be equipped with V2V, a type of V2X technology, by 2023. V2X technology complements ADAS and hence, the rising demand for ADAS is estimated to drive the connected car device market. The EU has made it mandatory for all vehicles to be equipped with eCall, a connected car technology that assists in emergency rescue during an accident. Implementation of V2X technologies is expected to reduce the number of accidents and thus, drive the demand for vehicle connectivity, which in turn is projected to boost the demand for connected car devices. Consolidation of various industries, such as automotive, telecom, IT, and insurance is driving the connected car device market. The Geneva Alliance, comprising Aisin Seiki, Delphi Connect, Magneti–Marelli, Visteon, Harman International, and Continental AG is actively working on the development of software and technology for vehicle connectivity. In terms of sales, the connected car device market has been segmented into retrofit and built-in. The built-in segment is expected to expand at a higher growth rate due to significant investments being made by automakers to deploy connectivity. The built-in segment has been further sub-segmented into embedded, tethered, and smartphone. Embedded technology poses a barrier to automakers due to the high cost of data management. Hence, automakers prefer tethered and smartphone solutions, as smartphones have been widely accepted by consumers. In terms of communication technology, the connected car device market has been classified into LTE and V2X. LTE based communication technology is being widely adopted due to its compatibility with smartphones. Rising penetration of tethered and smartphone integration is expected to drive the LTE segment. Based on vehicle type, the connected car device market has been segregated into passenger vehicle, light commercial vehicle, and heavy commercial vehicle. The passenger vehicle segment is anticipated to expand at a high growth rate during the forecast period due to high consumer spending and demand. The heavy commercial vehicle segment is anticipated to expand during the forecast period, owing to the demand for telematics and optimization of freight transports. Based on region, the automotive connected car market has been segmented into North America, Europe, Asia Pacific, Latin America, and Middle East & Africa. Europe and North America are held leading shares of the global market in 2017. However, Asia Pacific is estimated to surpass Europe and North America in terms of share of the global market by the end of 2026, owing to a rise in the income of consumers, which in turn is estimated to fuel the demand for advanced technologies in the region. 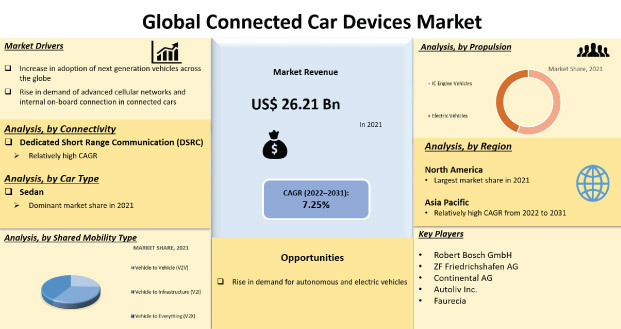 Key players operating in the global connected car device market include Delphi Connect, DENSO Corporation, Robert Bosch GmbH, Preh GmbH, Harman International, Infineon Technologies AG, Hella GmbH & Co. KGaA, Valeo SA, NXP Semiconductors, AISIN SEIKI Co., Ltd., ZF Friedrichshafen AG, u-blox AG, and Continental AG.